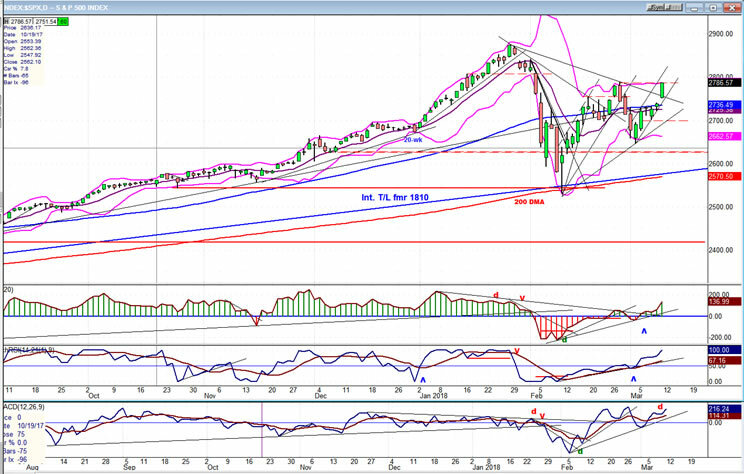 Intermediate trend – The intermediate correction from 2872 could continue until mid-May, but is mostly behind us. So far, the market is cooperating. On Friday, spurred by a strong jobs report, SPX was up nearly 50 points, closing the week at 2786. So we appear to be on track for the above forecast; but it could be truncated by some cycles which suggest that a consolidation should take place over the next few weeks. Minor cycle lows are due next week, and larger ones around mid-April. And then, the all-important 40-wk cycle is due in mid-May. So the forecast made above could be altered by some corrective action before we get the all-clear signal for a new high. In addition, the rally which started on at 2660, on 3/02, is likely to pause around the former high of 2789 (which is now only three points away) or a little higher; especially since we have either filled or are approaching the maximum projection for this rally phase, and negative divergence has appeared on the hourly chart. On the positive side, the daily indicators have returned to a buy signal, so the bulls appear to be in control for the time being and may not be inclined to give back too much ground over the short-term. We have to admit that this is a pretty bullish-looking chart! So why should we not expect prices to continue their upside progress right away? For the reasons that have been stated above in the Market Overview! The secondary low of 2660 (3/02) now appears to be a high-level retest of the initial low of 2533 (2/09). From a structural standpoint, it also appears to be the start of the next up-phase in the index. Friday’s strong upside momentum is unlikely to stop on a dime, but carry a little higher into early next week before minor cycles take hold. So there does not seem to be much in the way of further progress over the near term; at best, a brief consolidation before we complete the rally phase which started at 2660 -- unless the cycles bottoming (ca.) 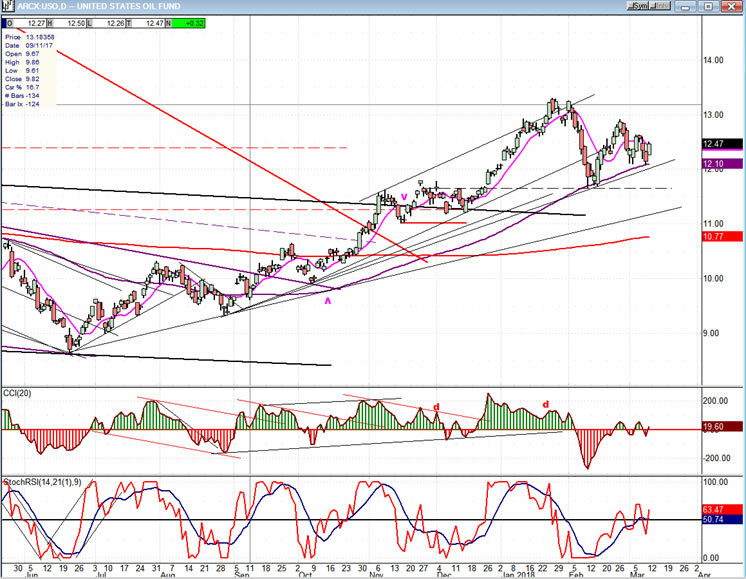 mid-April have enough pull to cause a deep enough retracement which would prevent the index from making a new high before the pressure from the bottoming 40-wk cycle become dominant. There is enough uncertainty about what the effects of the cycles bottoming over the next few weeks will be to prevent me from making a longer-term forecast until the larger cycle is out of the way. We’ll just have to confine ourselves to a short-term analysis of the trend until mid-May. At the end of Friday’s session, the daily momentum indicators gave a confirmed buy signal by rising higher instead of dropping back, which had been a possibility with the index still contained below important resistance at the 2730-35 level. However, the A/D indicator failed to make a new high and to give an all-clear signal. So we’ll just have to see what happens next week. Is the market strong, or is it just volatile? That’s a good question! It is very noticeable that segments A-B and A’-B’ are remarkably similar. They both start at about the same price level, find initial resistance at the same level, and then move straight up above that resistance to about the same level. Both denote a lot of strength (?) with an uninterrupted 85-point rally! Of course, the similarity may end on Monday if the current move keeps on going. For all that apparent strength, segment A-B came back down as fast as it went up, with an even larger decline! So, are we about to experience the same market action? Probably not! An EWT analyst would point out that the A-B segment was most likely the 5th wave of a move that started at 2537, while A’-B’ is probably a 3rd wave from the 2647 low. Maybe! But what about the cycles that lie ahead, especially the 40-week cycle due only two months away? It could produce a severe retracement in the market and mess up whatever pattern we assign to the current market action. This is why I suggest that we confine ourselves to only trying to define the short term until it is out of the way. Longer term, it’s fairly certain that we have not seen the top of the bull market, so we could reasonably expect a new high to be made after the 40-wk cycle has bottomed and propels prices back up after it reverses. Over the near-term it’s also very likely that whether we go up only three more points on Monday, or 14 more, the current move is now on a short leash. This is made fairly obvious by the negative divergence showing in the CCI along with a far less than super bullish performance in the A/Ds to support a 50-point move! The NASDAQ 100 components that are included in SPX are responsible for the volatility of the index -- not the NYSE components. The purpose of this section is not to analyze each index in great detail, but simply to compare the performance of the first two to the SPX’s to see if they support its current performance, or suggest that the latter is making an important top. I think that last week’s action in IWM says it all for now, and we don’t have to elaborate; although we may want to keep an eye on TRAN which was forced to reluctantly joined the party on Friday. 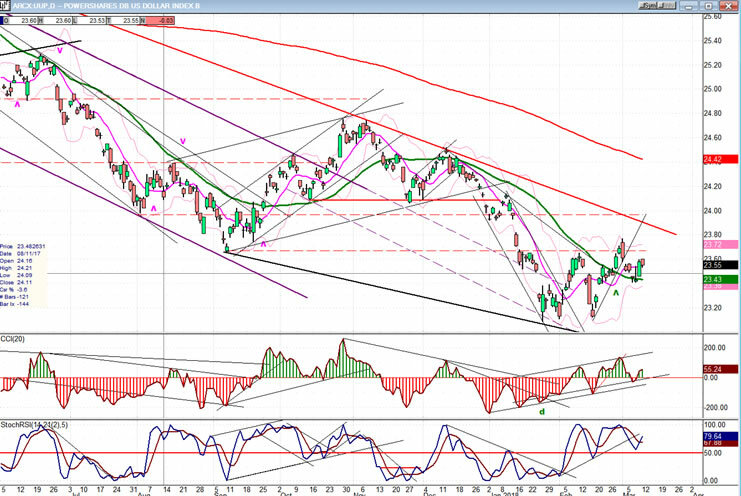 UUP has pulled back to the support of the (green) 30-DMA and bounced. 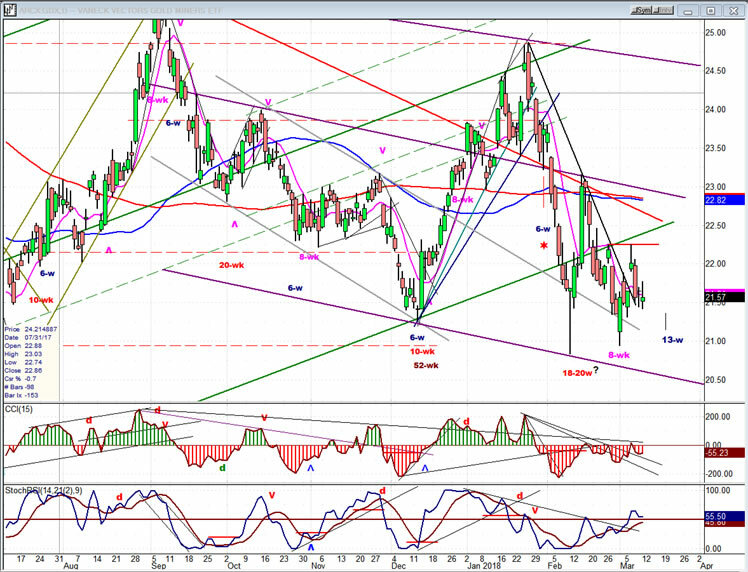 A break of that support would at least re-test the former lows and be a factor in causing GDX to start a rally. Recently, the action of GDX has been closely tied to that of UUP, and GDX is closely watching for UUP to resume its downtrend. This could come any day, even though the GDX 13-wk cycle low is still (ideally) a few days away. Perhaps a start now, with acceleration a little later? USO is still correcting and may not be quite finished. Even if it is not, no major correction is expected at this time. 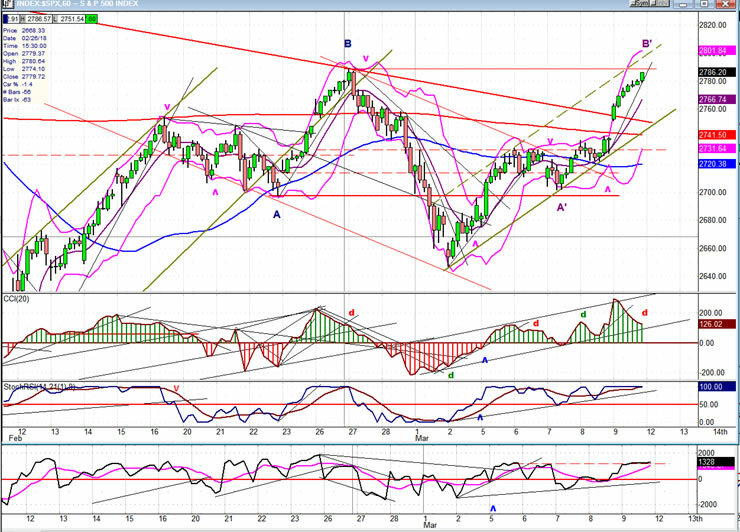 SPX could end Friday’s strong rally on Monday and start a minor correction. Cycles are, essentially, negatively biased until the middle of May, so the current structure is a little uncertain -- but will define itself over the next few days and weeks.